Dreamworld deaths: How could it have happened on this ride? Until today, the Thunder River Rapids Ride is the first ride I would put my kids on and the last one I would think would involve such a horrific accident. I went on the ride several times, most recently with my three youngsters in 2014. My 11-year-old daughter also went to Dreamworld only last week for a school excursion and took great delight in telling me she went on every ride, including the one in question. I now shudder in horror to imagine her there. I remember the ride as a pleasant, if rather non-eventful experience. Perhaps even mildly boring in this day-and-age of super roller coasters. You sit in a circular shaped craft which takes about eight people, and float down a series of canals, bumping along through several obstacles which you are helpless to do anything about. It also rotates as you roll down the ride, giving you an extra sense of chaos. It feels like being in a big shared dodgem car you can't really control, with the added novelty of water. You do get a bit wet along the way as various corners conspire to splash water in your face. Other than that, it seemed like fairly harmless fun. 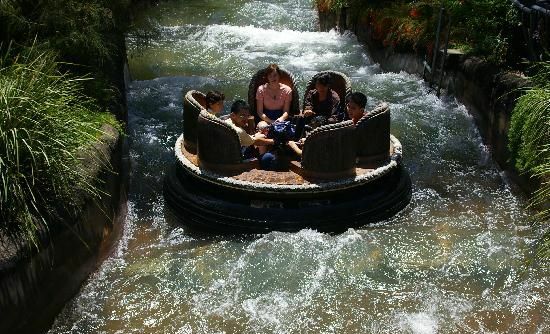 There was no dramatic drop at the end, like the well-known log ride which has been around even longer. It was not particularly heart stopping, like the Tower of Terror, which sends you backwards up a vertical tower at high speed before dropping you back down the way you came. I remember it as the one ride which you could put young children on who didn't pass the height test. "It becomes more real once the police tape goes up"
Dreamworld scare: "We were in line but went on other ride"